Could your home one day become a mini power plant? By all predictions, home energy is undergoing a real revolution. Advances in solar could one day allow households to operate virtually independent from the energy grid, generating and storing all the energy they need for themselves. However, if that’s ever going to happen, solar storage systems are going to have to get a lot more effective. Today’s batteries leave a lot to be desired. In fact, one of the largest battery systems, currently under construction in Long Beach, will only be capable of running 100 megawatts for 4 hours. To understand how much energy that is, consider that a megawatt is generally understood to be enough to power 1,000 homes. So 100 megawatts would still fall short for many metropolitan areas. 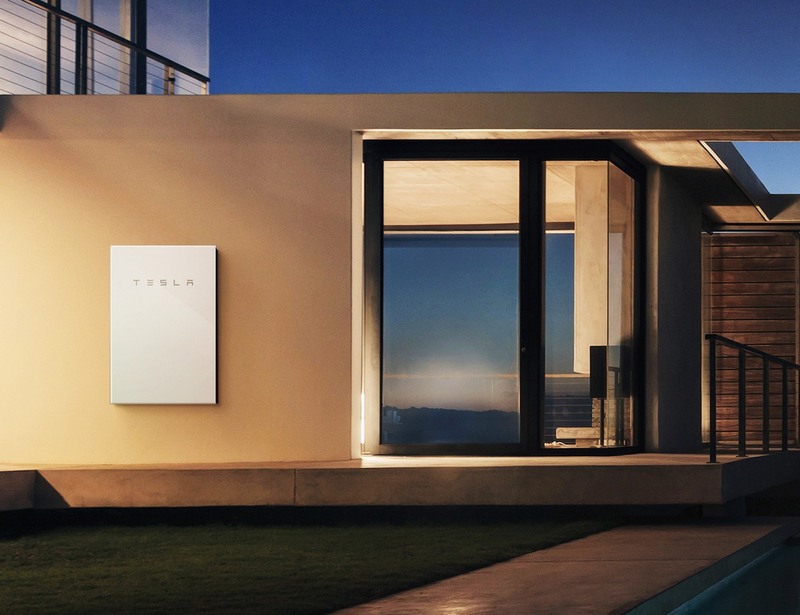 Tesla hopes to energize the home battery market using its own solar storage system: the Tesla Powerwall. While it didn’t get as much fanfare as their new solar tiles, the Powerwall nonetheless represents an important development in consumer solar power. Since its release, it’s become the number one option for homeowners looking for backup storage for their solar energy systems. Here’s everything we know about the Powerwall today—and what you can expect for the future. How Does the Powerwall 2 Work? How Much Does a Tesla Powerwall 2 Cost? Does the Powerwall Actually Help You Cut Energy Bills? Is it Worth it to Invest in Solar Storage Now? Tesla actually announced the first iteration of the Powerwall in 2015—but the product didn’t appear to be as successful as the company hoped. Instead of launching the highly anticipated product, Tesla removed all references to the first Powerwall and built a new model, released to the public in October 2016. Tesla claims that this newest 14 kilowatt hour system can power a two-bedroom home for a day. However, the unit is stackable, so batteries can be combined for use in larger homes. Tesla’s website offers recommendations for the number of Powerwalls you need to offset part of your energy bill, or the entire household, depending on the size of your home. The Powerwall 2 is made up of a lithium ion battery, complete with a built-in inverter. The battery stores backup energy from solar panels—and pulls from the grid when solar generation is low. For that reason, a Powerwall must remain connected to local utility grids—no off-grid connections. The units sit directly on a home’s walls, and they’re compact, so homeowners don’t need to install a separate battery room. Each Powerwall weighs around 200 pounds, but only measures about 7.1 inches wide from the wall. Powerwall owners can connect up to nine systems side-by-side to increase their storage capacity. Each unit contains a liquid thermal element that keeps your walls—and the battery components—from overheating. A Tesla Powerwall doesn’t come cheap—especially if you’ve already spent a pretty penny on solar panels and installation. A single battery unit will cost you $5,500, with an additional estimated $1,500 to cover the installation and hardware. Most homes will require more than one battery, though, especially when using the unit as backup power for an entire home. Each battery requires a $500 deposit when you put in your order. However, batteries and other solar equipment do qualify for the federal government’s 30 percent Residential Renewable Energy Tax Credit. So there could be a potentially lucrative tax break for your household come tax season. It depends who you ask. In practice, most people seem to be pretty happy with their Powerwall units. For instance, ABC Sydney reports that Australia’s first Powerwall customers are extremely pleased with their energy savings—they’ve seen a remarkable 90 percent drop in their utility bills since installing their battery system. Homeowners in the US report similar results. Some have seen their bills drop to almost nothing by pairing their solar energy system with a lithium ion battery. Solar storage is a young market—and battery systems are much less popular than solar panels themselves. Installers say that only about five percent of their customers currently opt for solar storage alongside their solar arrays. If you decide to purchase any kind of solar battery system right now, you’re leaving yourself open to some of the risks that go along with being an early adopter. For instance, solar batteries will likely grow much more efficient in the next few years. In fact, Tesla itself doubled its battery efficiency between its first and second releases, so you may want to wait to see how effective the technology gets before investing heavily in these units. Furthermore, while it’s pretty safe to bet on solar power, it’s unclear how storage will shake out—will energy be stored mainly in utility-grade installations that can handle a larger distribution of power? Or will residential units be the future of solar storage? At the moment, it’s difficult to say. Still, a Powerwall can save you a lot of money, so it really depends on what’s right for your household. But no matter what you decide, you can expect an energetic future for solar storage in the coming years.